Rajasthan, a state in North West India, is primarily a desert region and yet full of grandeur, gaiety and a rich cultural heritage. Perhaps the largest Indian state by area, Rajasthan literally means ‘Land of Kings’ or the ‘Kings Abode’. Home to some of the most magnificent palaces, majestic forts and sparkling lakes, Rajasthan is all about colours, royalty, warm hospitality, culture, traditions and myriad fairs and festivals. Rajasthanis believe in a celebration for every change of season, change in the different stages of farming like harvest, any religious occasion and basically an opportunity to showcase their impressive art and craft, general creativity and natural talent in the performing arts. Various regions of this state come alive and rejoice during these festivals, lending colour, gaiety and warmth, attracting hordes of tourists during these different times. Listed below are just a few of such quaint and exciting festivals and fairs held in this state. 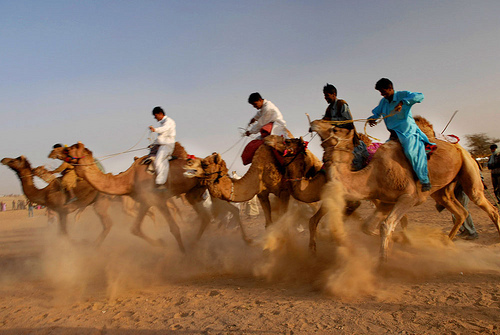 The most famous of all desert festivals, the Pushkar Fair is a magnificent 5 day event of camels and livestock, held in Pushkar on the banks of the Pushkar Lake in Rajasthan. 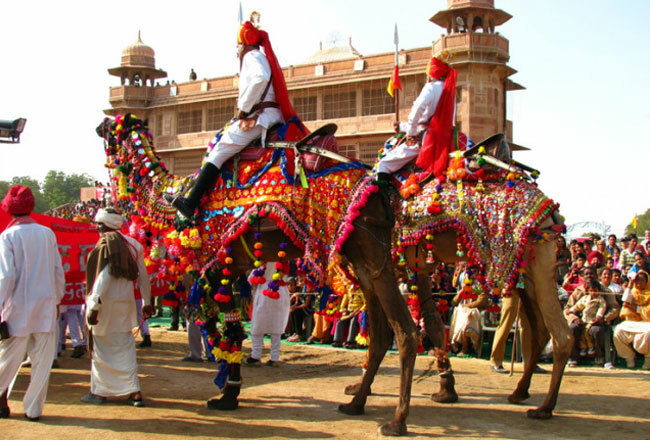 The fair is primarily a display of camels, along with other cattle and horses and culture and lots of colour. One can see camels in abundance at this fest, in fact this may be the only place in the world where thousands of camels can be seen at one go. Held in the month of October and November, in the past, this fair was held with the aim of livestock trading between livestock traders and till date this fair is held in remembrance of this tradition. Camel, horse and donkey races are organized at the fair, drawing hundreds of excited spectators. One can also enjoy various puppet shows, gypsy dances, music and dance performances held in the open-air theaters, as also several products like camel milk cheese and cakes. The festive atmosphere and spirit of revelry is very infectious at this fair. 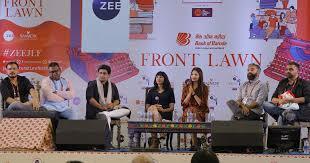 Quite a high- profile event, as compared to the other festivals and fairs in Rajasthan, the Jaipur Literary Festival is described as one of the greatest literary shows in the world and perhaps one of the world’s largest free literary festivals. Here, some of the world’s greatest minds, authors, Booker prize winners, debut novelists, historians, Nobel Laureates, humanitarians, sports people, business leaders and celebrities from the world of entertainment come together for five days of readings, discussions, debates, ideating and sharing thoughts. This grand fest takes place at the Diggi Palace in Jaipur and provides a wonderful learning opportunity for the youth and aspiring writers. The Rajasthan International Folk Festival is a much awaited event, which is held at the Mehrangarh Fort in Jodhpur and celebrated around Sharad Purnima, the brightest full moon night of the year, in the month of October. This five day festival is essentially a celebration of Indian as well as international music, highlighting the cultural lifestyle of India and is regarded as a People’s Platform for Creativity and Sustainable Development by UNESCO. 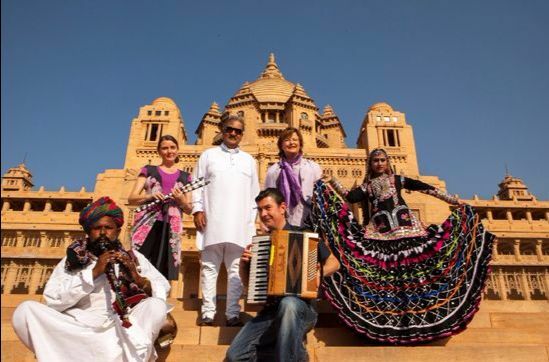 Patronized by the Maharaja of Jodhpur, this festival aims to promote folk music and art and hosts more than 250 artists who entertain with a fusion of Indian and international music and leave the audience awestruck with some phenomenal acts and world-class dance routines. Over the years, the fest has seen the likes of Grammy Award Winners, Sufi musicians from around the world and Indian folk artists. This exotic three day event primarily showcases the several aspects, delights and beautiful cultural heritage of Rajasthan. The city of Jaisalmer, where this event is held, comes alive in the month of February with artists dressed in brightly coloured traditional finery, song, dance, camel races, several competitions, desert rituals and stalls offering delicious food and art, souvenirs and handicraft items. Organised by the Rajasthan Tourism Development Corporation, a very exotic feel is created at this festival as one has to relax on the beautiful golden sands of the Thar Desert and enjoy the various events under a beautiful moonlit sky. Some of the most popular events are the turban tying and Moustache competitions, camel races, gymnastic stunts and fire dancers. The Kota Adventure Festival is one of the most fascinating festivals of Rajasthan, celebrated during Dussehra, in the month of October. A complete thrill for adventure enthusiasts from all over the globe, this festival aims to promote tourism in Rajasthan and therefore a week long extravaganza of adventure sport events are organised for this festival. 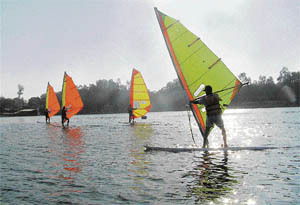 Tourists looking out for this kind of fun, are most eager to participate in this fest as one can enjoy rafting, wind surfing, paragliding, parasailing, hot air balloon rides, kayaking, jet-ski rides, rock climbing, angling, trekking and rural excursions. Another highlight of the festival is kite-flying. 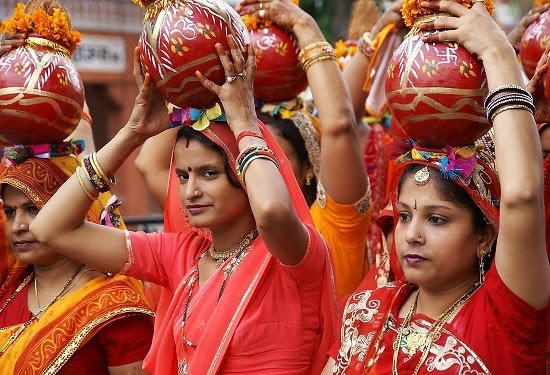 Teej festival is one of Western India’s biggest festivals and is celebrated in the monsoons between July and August. This festival is held in honour of a woman’s love for her husband and to seek blessings for a happy married life. It also marks the arrival of the monsoon season which is welcomed joyously as Rajasthan is mostly a desert region. Married women at this time are dressed in beautiful traditional costumes, mostly green in colour and partake in song and dance to invoke the blessings of the almighty. They receive gifts from their family which may include a sari or jewellery, henna or bindi along with some traditional sweets. Fairs and grand processions are carried out in honour of Goddess Teej, along with decorated horses, camels and elephants.